We would recommend Mary and her excellent staff to anyone who was planning a wedding or any other type of reception. Thank you so much for the fabulous job you did at the brunch after our wedding. The food was fantastic! We will definitely recommend you to our friends in the Outer Banks, and look forward to employing you for our one-year anniversary! Please feel free to use us as a reference. Thanks again. You surpassed our expectations and we received many, many compliments, not only on the food, but on the friendly and efficient helpers you brought along. ...the food you prepared was superb. Some of the favorites were the appetizer brie with berries and the tuna bites. Everything you prepared was excellent. 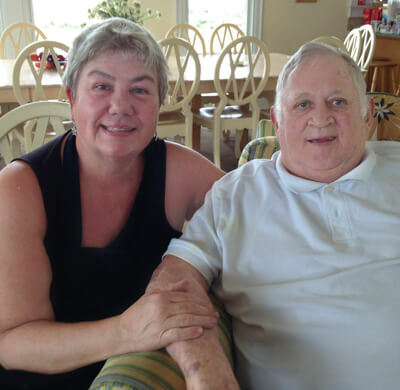 Mary with long-time client, Charles Johnston of Charlottesville, VA. Mr. Johnston has used Mary and The Kitchen Witch Catering 18 times over the last 25 visits to the Outer Banks.